WWII is a favourite time period of mine that I always try to read about as often as possible. Most of the books I know are set in Europe (Italy, France and the UK). Except for Pearl Harbour, I knew very little about what was happening in the US. I remember reading about work camps for Japanese families in a few articles and this was it. Bridge of Scarlet Leaves (I just love this title) gave me the opportunity to learn more about the subject. This is a story of love, family, honor and forgiveness. I laughed and cryed and sometimes both at the same time. No need to say that I was completely hooked from the first to the last page. There's no unidimensional characters in Bridge of Scarlet Leaves. I immediately had the feeling that I knew everyone, like I was living in that small community for years. When Pearl Harbour is attacked and the public opinion about the Japanese community changes, I cannot help but to suffer along with the Moritomo's. This family was living for years in the US, their children were born there and suddenly they became the enemy. Slowly, we see how the war changes all the characters and it's a real pleasure to see that everyone has it's qualities and flaws like real human beings. One of my favourite parts (a very hard choice since I loved all the story) was Maddie's vision of the work camp. An American amid all the Japanese immigrants and their offspring entrapped in awful dailylife conditions. The tensions become even stronger inside the camp between the community. I couldn't help but admire Maddie's determination to show everyone that she was Lane's wife and part of his family. Even if I couldn't help but to fall for Maddie and Lane, T.J. and Jo kind of steal the show. They are both stubborn and tough, but their kindness and protective feelings towards their families and friends are quite impressive. In the end, I was craving for a little bit more about these two, even if this didn't change my mind how I felt about this book. Highly recommended to all history buffs who enjoy epic stories and beautiful prose. Just an advice, don't start reading it just before you go to bed. Don't forget to read Why I Love Writing About WWII by Kristina McMorris. This sounds very good. I read Hotel on the Corner of Bitter and Sweet recently, which is also about Japanese camps in America during WW2 but didn't love it. Maybe I will have better luck with this one? I didn't read the Hotel on the Corner of Bitter, but i's on my TBR for some time now. 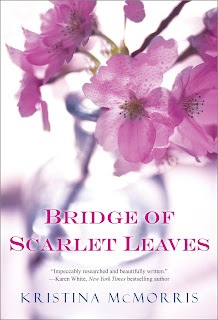 I truly hope you'll enjoy Bridge of Scarlet Leaves as much as I did !